The EBC organic pad is a direct replacement for OE brake pads. The main difference is that the Organic compound is kinder to the Brake Rotors whilst having a brake feel that is prefered by many a motorcyclist around the world. The Organic brake pad is manufactured to have expansion grooves which reduce noise pollution and prevents cracking. 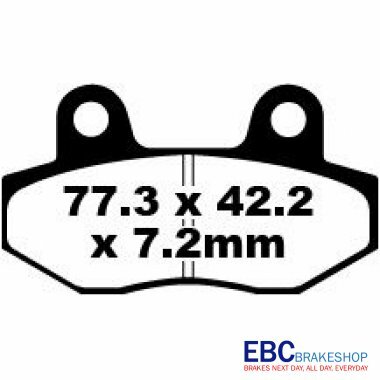 The EBC organic brake pad is ECE R90 approved which means that its tried and tested to offer safer braking than other brake pads compounds. EBC Bike Brakes - What’s Stopping You? EBC Brakes offer a complete range of Organic and Sintered brake pads including the world renowned Double-H™ sintered pad, also available are brake pads for Moto X and ATV’s. The discs are just as impressive with the patented SD system on the Pro-lite X and the Pro-lite XC series. EBC have been at the forefront of Motorcycle brake technology for many years and are still finding ways to improve on the current award winning brake components. The EBC motorcycle range have been a success both on the street as well as the track and can boast being Run in some of the Top motorbike championships including both Superbikes and Moto X. Heard of Travis Pastrana? He is another champion that uses EBC whilst competing in X-Games. The EBC Sintered pads are made in the state of the art facilities in Cleveland, Ohio in the USA, and the Organic pads and the complete Motorcycle brake disc range are manufactured in Bristol and Northampton Respectively. Want the Best Set-up on your Superbike for the Road? Try the Double-H™ sintered pad with either the Pro-lite X series Discs or the Pro-lite XC series Discs. If you want the best setup for the occasional track day then use the EPFA sintered Pads with either the Pro-lite X series or the Pro-lite XC series.